I talked last week about the “Christmas Showcase” we got to have at our house. This week, I’m posting another song from it! 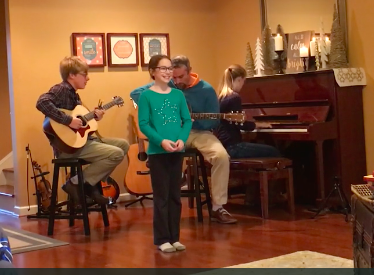 Anna did a fantastic job learning the lyrics and melody for “Rockin’ Around The Christmas Tree.” She’s a natural! It was super cool getting to perform our song and see how the practice paid off. I’d love for you to take a listen! You guys are the best Cummins entertainers I know! Uncle Sherman and I love you so much. Thank you for sharing your God-given talents with so many! Thank you, Aunt Kay! Love you both so much! I’ll tell her you said so! Thank you! She’ll be pleased as punch. Awesome job Anna… I love listening to all of you….playing and singing! Merry Christmas 🎄 love to all of you!! Thank you, Mrs. Linda! We hope you have a wonderful Christmas! Much love! Merry Christmas ,wish I was there to jam with you. That would be so fun, Grandma Nola. I hope you have a lovely Christmas! Love you! Thank you! We hope you have a wonderful Christmas! Quite the wonderful entertainer!! She is a natural, for sure! Great performance, Anna! Thank you, Grandma! We loved getting to play it for you. Thanks for always being such an encourager! Love you muchly! Thank you! Merry Christmas, Gracie! Haha, yes! Thanks for playing in the recital, Ethan!